Hawaii running back Nate Ilaoa plans to petition the NCAA for another year of eligibility after enjoying the best game of his career last night. Though listed as a senior, Hawaii running back Nate Ilaoa is holding out hope that his biggest game of the 2005 season wasn't the last of his career. Ilaoa ended the year by rumbling through the San Diego State defense for 211 total yards in helping power the Warriors to a 49-38 win over the Aztecs in last night's season finale at Aloha Stadium. "I hope so," Ilaoa said as he walked off the field. "I think it's a matter of paperwork. I have to go through some stuff and we just have to wait. I want to come back, and that's the main thing." For the first time since 2001, there will be no bowl game to extend the season for the 5-7 Warriors, so the traditional senior walk carried with it a sense of finality for the UH contingent. But Ilaoa was among a group of seniors still planning to be around for next year's ceremony. Ilaoa, who carried the ball 15 times and rushed for a career-high 151 yards and scored two touchdowns in the second half, will petition to gain another year of eligibility after missing most of two seasons with injuries. Last night's game wasn't the first time Ilaoa frustrated the Aztecs. 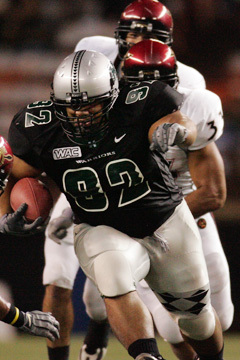 He ran for 44 yards and scored the winning touchdown in UH's 41-40 victory over SDSU in 2002. "We're just out there as a group collectively trying to get the ball through that goal line," Ilaoa said. "Throughout the season we've been doing it. It's just a matter of getting it on a consistent basis. That comes with being a veteran. We've been off, but when it gets going, it looks real nice." Although he didn't participate in the senior walk, Ilaoa felt a bond with the players he broke in with as a freshman. "We all came in young, right out of high school, five years of growing up together," he said. "Throughout the whole game I was thinking about the good moments we had. We've seen victories, we've seen down times this year and that's just going to make us better as people." Defensive end Melila Purcell could also gain another season if he reaches 80 percent of the credits needed toward graduation by the end of next summer. Safety Leonard Peters, running back Bryan Maneafaiga and receiver Ian Sample missed most of this season with injuries and will petition the NCAA for another year of eligibility. For the rest of the class of 2005, last night's win provided a positive end to a rebuilding season that ended short of the postseason after Hawaii Bowl appearances the previous three years. Offensive linemen Brandon Eaton and Derek Fa'avi helped clear the way for UH to run for 262 yards. Eaton also kept a drive going by forcing an SDSU fumble in the third quarter after Aztecs linebacker Freddy Keiaho scooped up a loose ball. "It didn't hit me until we said the prayer after the game, the clock said :00 and we were winning," Eaton said. Linebacker Kila Kamakawiwo'ole finished with a team-high 10 tackles and broke up two passes. Safeties Lono Manners and Lamar Broadway had six and eight stops. "It's been a rough season, but I'm happy with this win. I don't care about the record we hold," Kamakawiwo'ole said. "I'm happy with what I achieved and what I did. I hope the young guys step it up next year." Linebacker Tanuvasa Moe's night ended early due to a sprained right knee, but he still enjoyed finishing out his career with a win. "I'm going to remember this group of guys, and probably this game the most because it's my last one," Moe said. "And I have to thank Nate Ilaoa, everybody who played great, I have to thank them for making it so sweet on my last night." Others who took part were quarterbacks Kainoa Akina and Jeff Rhode; defensive lineman Tony Akpan; linebackers Ikaika Curnan and Adam Iloilo; and defensive backs Lamar Broadway, Landon Kafentzis and Turmarian Moreland. Hawaii senior Ikaika Curnan received a high-five from 3-year-old Tanuvasa Moe Jr., son of UH senior Tanuvasa Moe, after last night's game at Aloha Stadium. Kenny Patton, left, and the Warriors defense tried to bring down San Diego State's Lance Louis during the first half of last night's game. 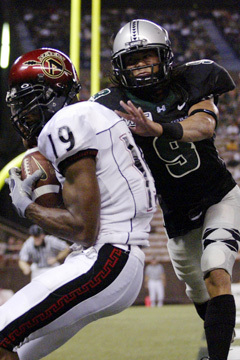 San Diego State's Jeff Webb snagged a touchdown pass in front of Hawaii's Ryan Keomaka in the first half of last night's game at Aloha Stadium. Hawaii's Brad Kalilimoku tackled San Diego State's Lance Louis in the first quarter of last night's game at Aloha Stadium. 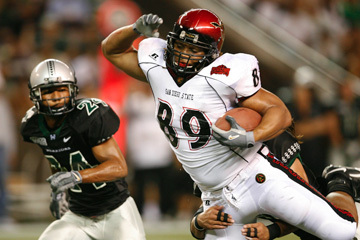 Hawaii's Reagan Mauia plowed through San Diego State's Marcus Demps during the second quarter of last night's game.